Doing it all is a pretty tough thing. There is so much to keep track of and so many different aspects in play. The best of the best are able to find balance and move throughout their individual realms accordingly. 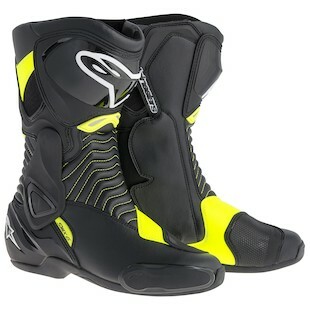 To that extent, the Alpinestars SMX 6 WP Boots have been designed to be equally at home on the track or on the street in any weather. As a follow up to the Alpinestars SMX 6, this iteration now adds waterproofing to the mix in an anatomically profiled boot packed with innovative features. With a main upper material constructed of advanced microfiber encasing a waterproof liner that will keep your feet dry when it counts, these boots offer superior ergonomic fit and functionality. With TPU lateral ankle brace support between the top of the calf and the ankle while the internal sole with shank reinforcement adds overall stability for a better ride. In the end, you have to have the right shoes for the job. Though it is tough to get a boot that incorporates all features for all situations, the combination of street, track, and waterproofing options on the Alpinestars SMX 6 WP Boots are a great place to start.